Bluefish, Mackerel, and SPECIES #50!!! It was August 9th, 2015, a beautiful Sunday. 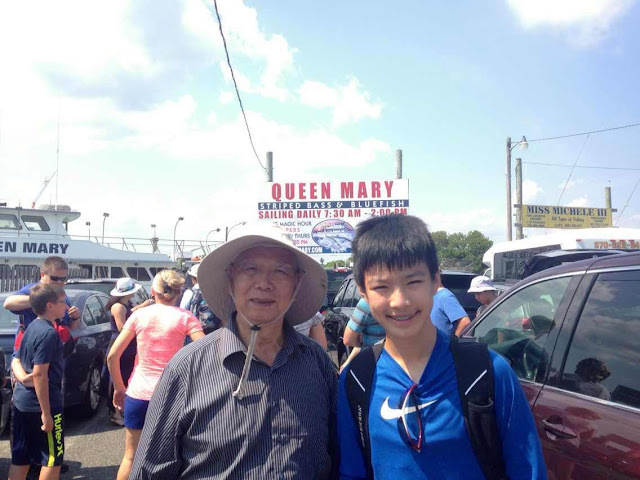 We had booked another party boat trip, this time off Belmar instead of Pt. Pleasant. My mother happened to have a colleague who shared my passion for fishing and they organized a get-together. The team was: Myself, my grandfather, Anther (the colleague), and his daughter and her friend. It may not look that bad, but it was pretty windy out there. 8 ft waves were present. We got to the spot just as other party boats were arriving. I found it interesting that there were about six different boats spread out in the same general area. Anther was a regular on this boat, and he brought more than enough rods for all of us. I grabbed a spinning combo, and set out fishing. our rigs consisted of a small diamond jig with a tube trailer, and a dropper rig with a teaser on the top. You can see it in the above picture. After that first fish, it was complete mayhem. The five of us were hauling in fish after fish!!! The mates started cutting mackerel up, and chumming the water. We all grabbed chunks to tip our teasers and jigs. I also tied on a bare hook and put on a big chunk of mackerel. When the mates started to chum the water, mackerel started feeding at the surface. These fish are torpedo shaped, and swim insanely fast. We could see them darting between the chum. It was like no experience I've had before, it was extremely cool. When the mackerel started appearing at the surface, I focused my efforts on the top 15 ft of water. The bait got the most bites, but the jig and teaser did very well as well! I hooked a total of seven doubles, but only landed three. I have to emphasize that these fish are very strong. Usually when I hook doubles, fish fight against each other and there is less resistance, minus the extra weight. Mackerel, however, fight in unison, and peel plenty of drag when hooked together. I was surprised at how much pull this little fish had! But back to the action! It was getting kinda funny, I was bringing up fish after fish, and people started coming over and asking me tips on how to catch them. A few people had small bluefish coming over the rail. We were right in the middle of a mackerel hotspot, but there were some similarly sized blues hanging out with the mackerel. Anther said this was not uncommon. As I didn't see any bluefish on the surface, I returned my efforts to drop and reel. Eventually the mackerel got scared off by some blacktip sharks that had arrived, so they returned to deeper water. Two people actually hooked the blacktips, and the mates cut the line. That was too bad. I wanted to see a blacktip, but I guess that would be too dangerous with the amount of people on the boat. When the sharks left, people started to catch more fish. After a couple of mackerel, including some "jumbos," I hooked into a fish at mid-depth with a more sluggish fight. Was this my lifer bluefish? I tentatively lifted it over the rail and grabbed it. It had bit on my teaser, and I was glad I unhooked it uneventfully. Some nasty teeth are in those jaws. Behold! The bluefish, species #51! 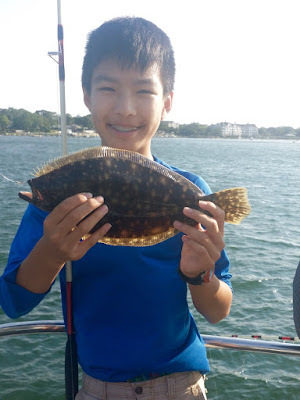 Only a few people got bluefish that day, and I was ecstatic to be one of them. 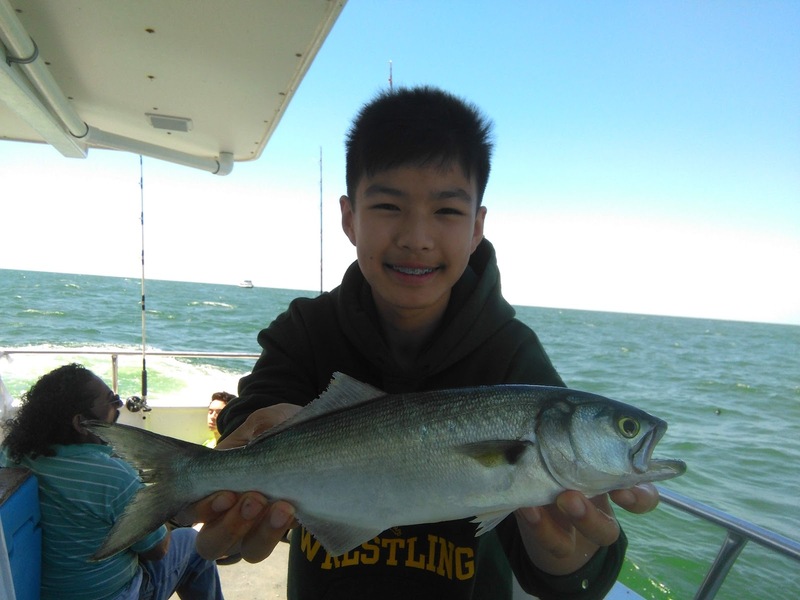 All the bluefish were pretty small; mine was the second largest and almost won the pool! I caught some more mackerel, and then it was time to head back. Luckily, the water was much calmer during the afternoon. The mates cleaned our fish, and we brought home a big cooler! 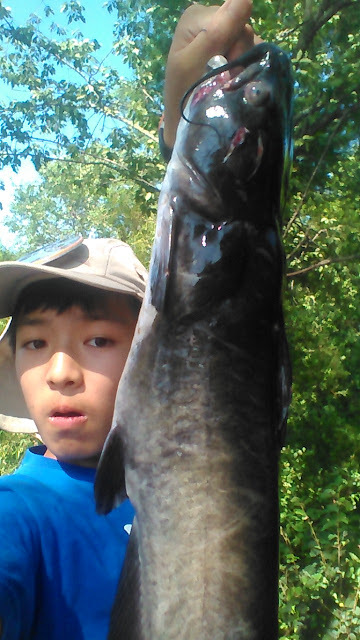 This pic was taken during fishing. We caught much more. Collectively, my grandpa and I caught 22 fish. 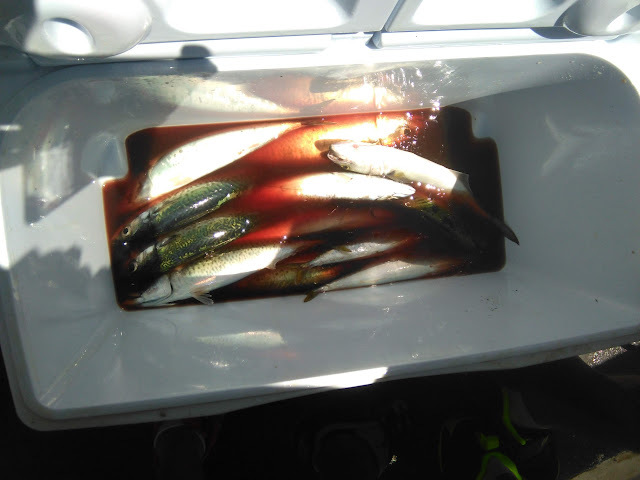 I caught 15 mackerel and 1 bluefish, and my grandpa caught 6 mackerel. 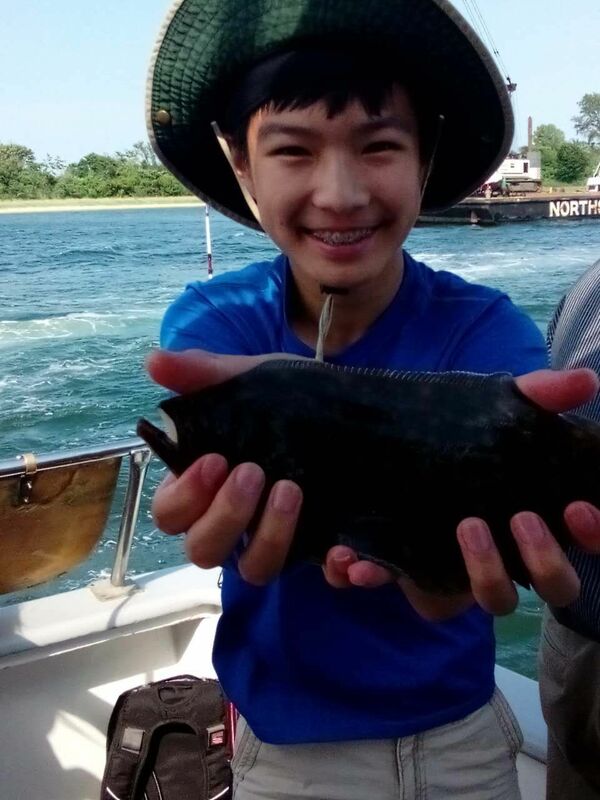 To be fair, it was his first time fishing in deeper waters in the ocean. On my first time, I got skunked. Anther, his daughter, and his daughter's friend caught probably around 40 fish. After we docked, we tried some fluke fishing from shore, as it was a gorgeous day. We got skunked, but it was really nice out, so we really didn't care. A big thanks to Anther for bringing us out, and I hope we meet again! After my previous experience at the pond in Hillsborough, an opportunity presented itself, and I was headed there again on short notice. This time I brought two rods, both for bottom fishing. I only had an hour and a half, so I decided to just let the fish come to me instead of wasting time walking around. Both rods had a standard bottom rig with a sliding sinker, than a short length of 15 lb mono tied to a 3/0 circle hook, baited with cut creek chub, sunfish, or baby bass. Upon arriving at my spot, I found it was already occupied with some kids from my school. It turns out they had seen my blog post and decided to come here in search of large catfish. We had a chat, and it turns out they were not as successful as they wanted to be, with only some sunfish and bass. They had taken my spot of choice, so I moved about 10 yds away and set up my spread. My Grandpa was with me again, and he also set up, but only with one rod. Soon enough, they left, and I was able to get the good spot. Long story short, it was slow. 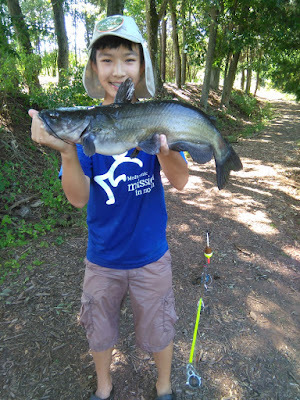 It was a lot cooler than the previous days, and that made the fish slow down a little bit. I had a lot of bumps and tears at my cut bait, probably bullheads and turtles. Still, this pond lacks the giant snappers that make catfishing on the golf course so hard. I had a few runs, but just couldn't hook up. 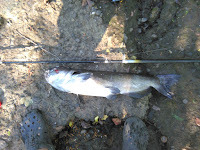 After a lull in action, I took one of my rods and caught some 10 inch bass, but nothing noteworthy. 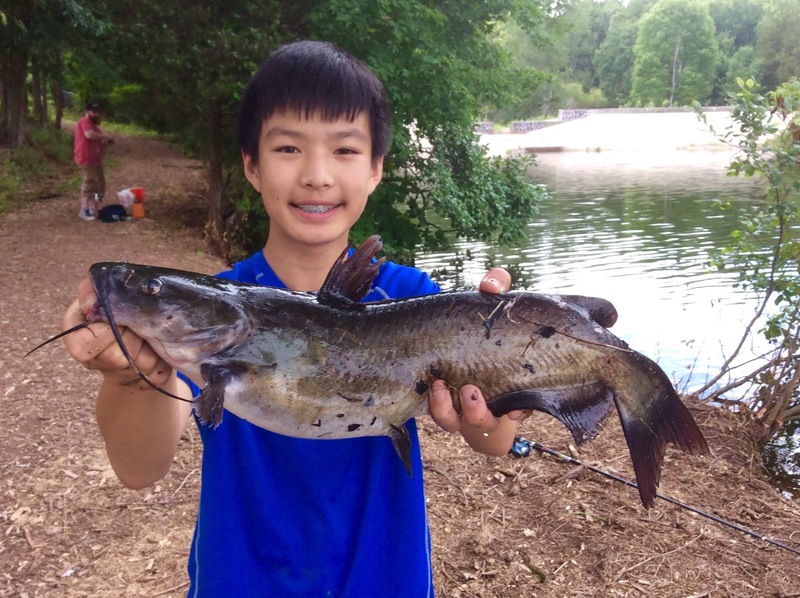 A pair of anglers showed up next to me, fishing for catfish with only one bullhead caught. It was getting close to the end of my session,so I tossed my bottom rig back out, so I again had a 2-rod spread. Not 10 minutes passed when I heard the rod bells. The previous knocks I received were light taps, barely jingling the bells. This one was different. My rod, ant an almost vertical position, just slammed down with force. I wrenched the rod out of its holder (I learned from my previous encounter :) ), and reared back. 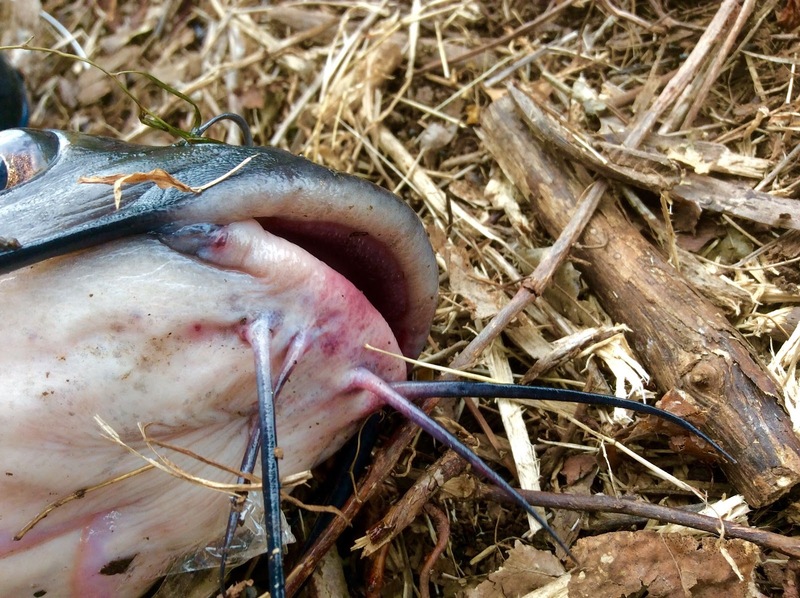 Catfish are not weak. This one was not too large, but a very decent NJ kitty, and it did peel plenty of drag. The hookset was solid (circle hook, so the fish set itself), and I brought it to the bank where my grandpa expertly netted this fish. 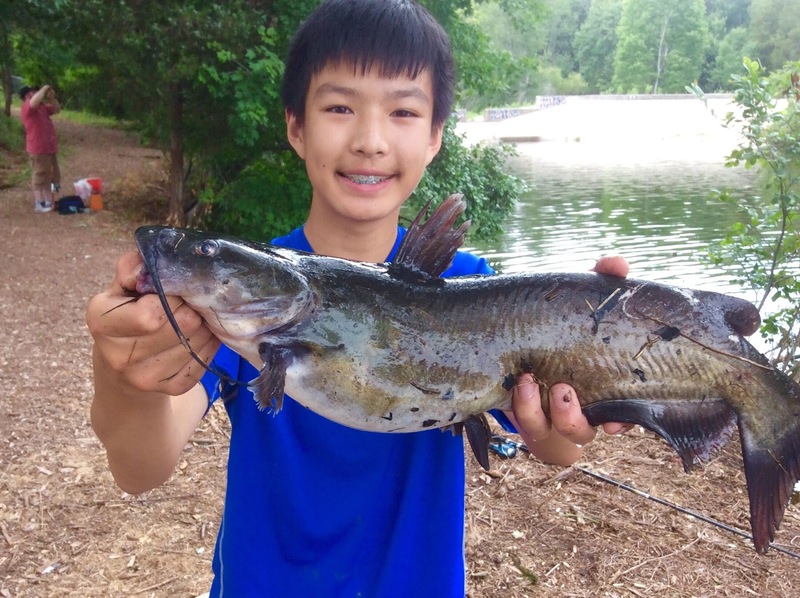 It turned out catfish like both habitats. The ponds structure is a deep channel in he middle surrounded by gravel/sand/mud shallow areas, some more flats-like than others. My theory is that they like deep water with shallow feeding areas nearby. Last weeks channel was hooked in shallow water, but upon feeling the hook, quickly retreated into deeper water dragging my rod along with it. Its by no means correct, since fishing is fishing and there is ALWAYS exceptions. But it is some interesting knowledge for the future. On the scale, it weighed 3.91 lbs, pretty close to my estimate of 4. 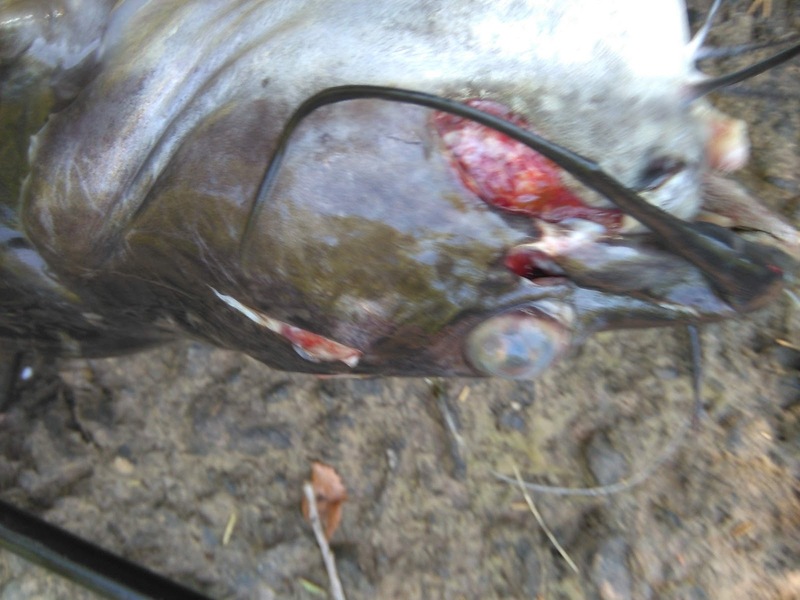 One thing I noticed in particular though, was the size of the mouth compared to last weeks channel catfish. It was much, much smaller, but the other one was just under 2 lbs larger. I'm doing a catfish oil painting, so info like this is always helpful, as well as reference shots. 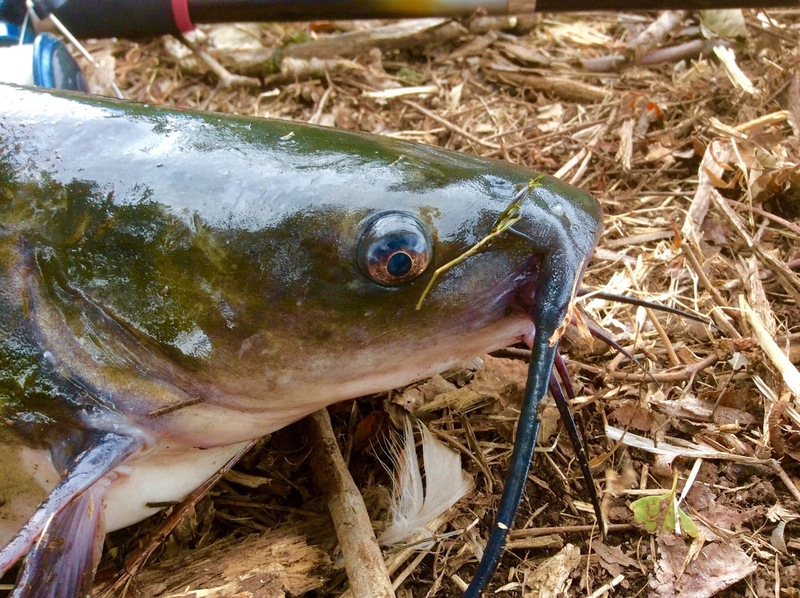 A thrashing, powerful, bulldogging fight... that is the lure of a big channel catfish. And I may have found my new hotspot. Last Friday I participated in a fishing derby at a pond in Hillsborough, NJ. I didn't win, but I learned that the lake contained some nice channel catfish. At the time, I wasn't prepared, but I came back the next day with cut bait. I had about 3 hrs to fish, ans I set out with a 2-rod setup, one with a slip bobber (1/0 baitholder j-hook), and the other with a bottom rig (3/0 circle hook). The slip bobber one had a baby bass, while the bottom rig had a whole creek chub. My grandpa, who accompanied me, put on a small hook for sunfish. My Grandpa and I found a good looking piece of bank, and set to fishing. I was a little ways away from my grandpa when the bell on the bottom rig start ringing. My grandpa set the hook, and when I ran over, handed the rod over to me. 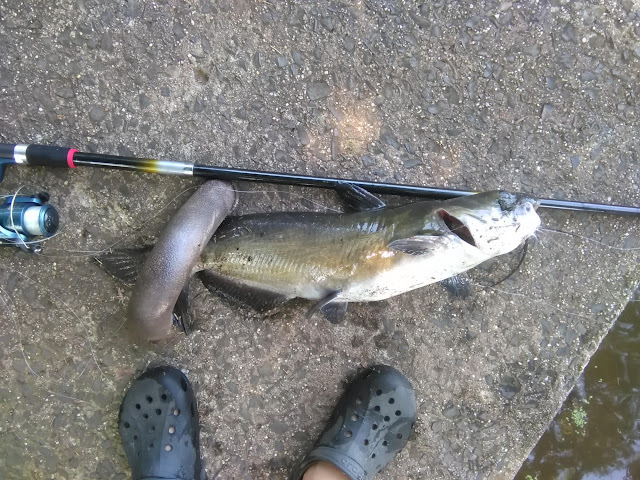 I got the fish to within a foot of the bank, and it was a big channel kitty!!! It was around 7 lbs, thrashing wildly, but I forgot the net, and the fish popped off right at shore... That was a disappointment. I turn and my rod is 10 feet into the lake, quickly being dragged out. At that point, instinct took over. Before my thinking part of my mind realized what was going on, I had jumped into the water and was swimming towards my rod!!! Luckily, the water was only up to my chest and the fish slowed down, allowing me to grab the rod. I took it out in a split second and handed it to one of the guys while I was backing out of the water. I was completely soaked, and trying to gain control of an angry beast at the end of my line. 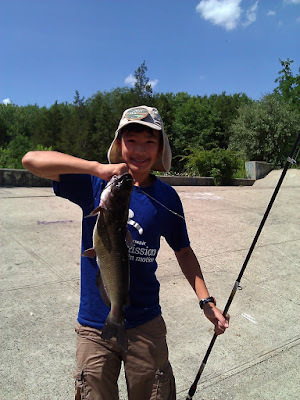 My slip bobber rod was much lighter than the other rods, with lighter line as well, one that I usually use for pond bluegills, bullheads, and bass... This fish felt monstrous! My rod was doubled over, thumping under the pressure. It was definitely one of the hardest fights I have ever fought with a fish. Whatever was on the end of my line even peeled drag on all of its blistering runs! That bzzzzzz sound definitely got my adrenaline pumping! I was able to turn it away from the snags near the bank and fight it out in more open water. After 2 minutes of tug-and-war, I brought the fish to the shore, and saw that it was a nice channel catfish!!! This was a fat, healthy,perfect specimen, with no fin damage and smooth, sleek lines It was the build of a powerful fish. 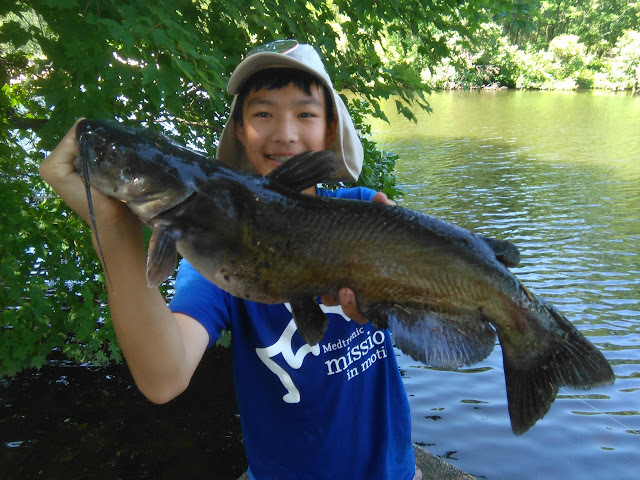 It differed much from my Millstone River channel kitty, with a much fatter belly and a more lighter and yellower tone. On the scale, it weighed 5.88 lbs, slightly smaller than my first specimen. Because I was using a j-hook, it either was luck that I hooked it right in the corner of its mouth, or it was my epic swimming hookset. :) The hook came out without too much issue, and I got to watch this beast slowly swim back to the depths. After that catch, I took some gear and wandered around the pond. 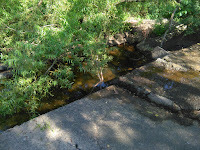 There was another dam on the other side of the pond, where water slowly trickled into a tiny creek. 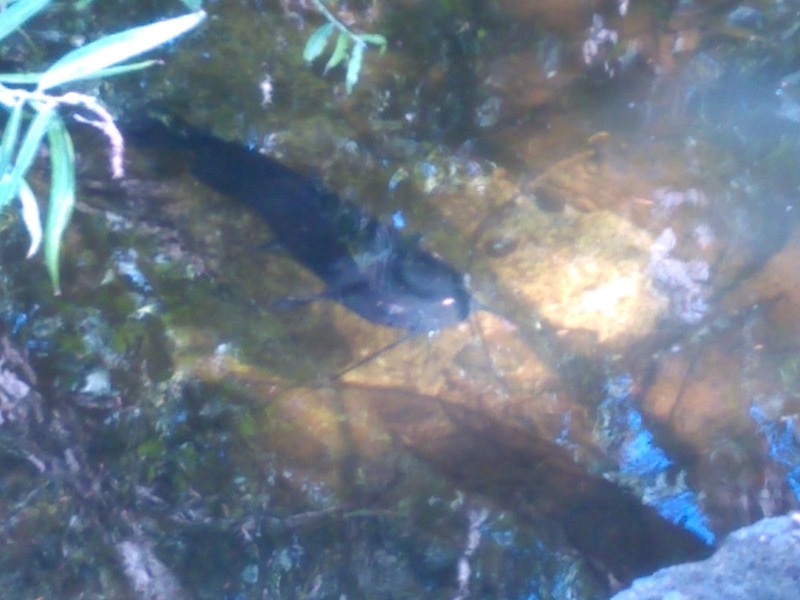 Upon walking across, I noticed a nice channel catfish in a pool no more than 8 feet across and 2 feet deep. It had fresh scars and gashes all over its body. 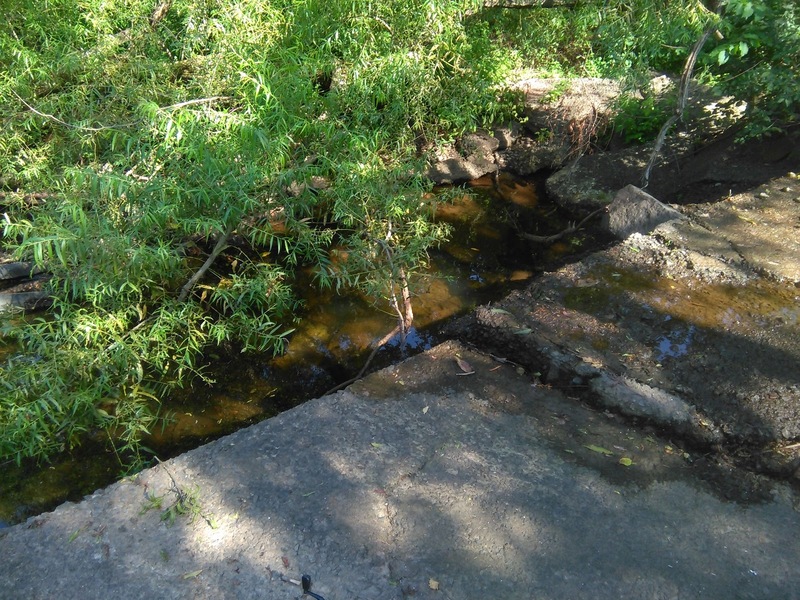 My theory is as follows: In a flood, the fish was washed over the concrete ledge and fell over, hitting the rocks and concrete, scraping all over and breaking its jaw. Yes, the fishes jaw was broken. I decided to try to catch it and release it back in the lake. There was no way the fish could survive in such poor conditions and shallow water for long. I set my cut bait down and waited. After a while, I gave up and decided to head back. The fish clearly was not in the mood to eat. 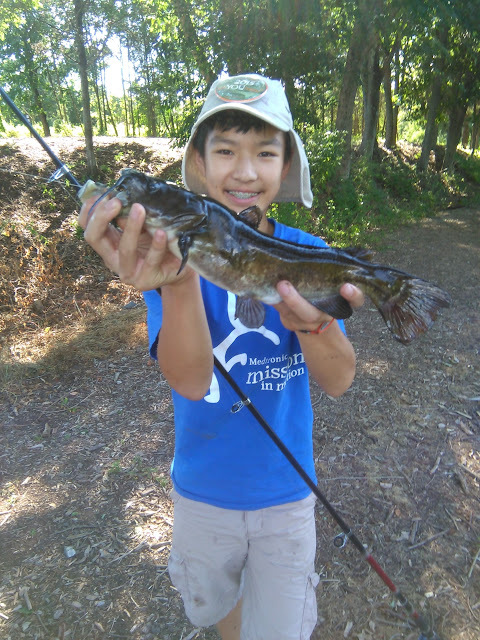 When I lifted my rod to reel in, however, I felt tension and set the hook. 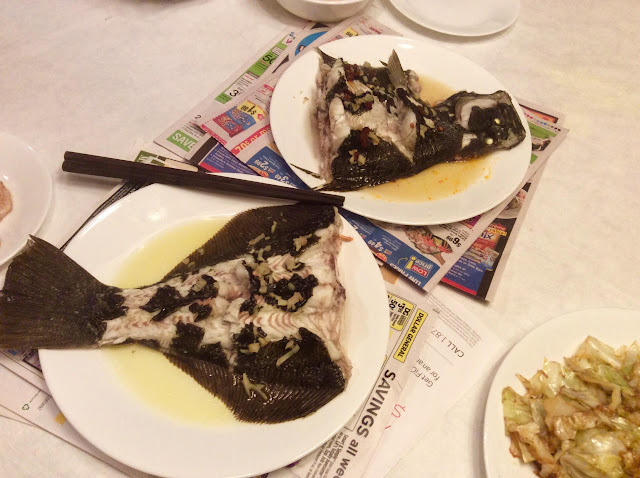 The fish fought to its best ability, but it really had nowhere to go and I brought it in with relative ease. This kitty had quite a personality, though. It bit my hand much harder than any over channel and gave me a cut to show for it. It turns out I had hooked him right on top of the mouth, not in it. I think he was merely looking at my bait when I started to reel in. 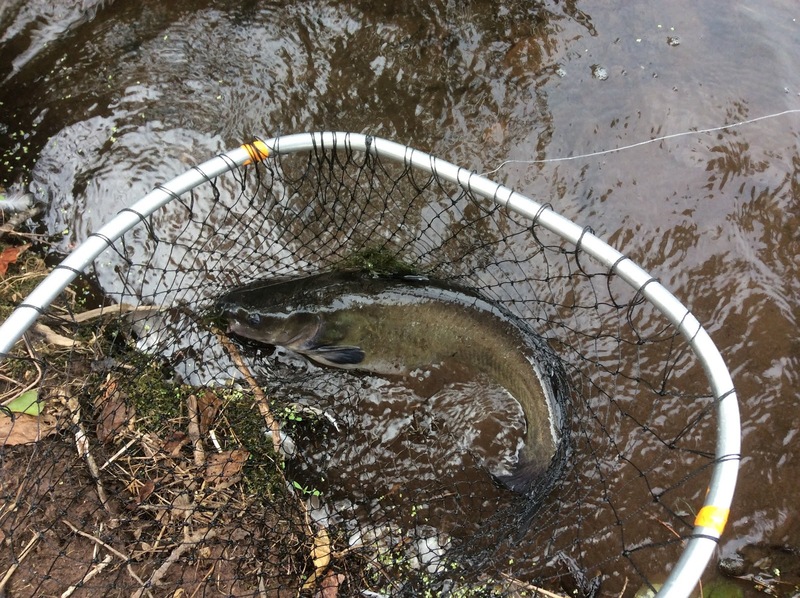 There is no glory in a fouled fish, but I released him into the pond so he could live. I took a walk around the lake, looking for good spots, but I found myself returning to where my grandpa was and setting out only one bottom rig. I decided to set down and wait events. We only had about 15 minutes left, when the bells started ringing. I ran to the rod, unclipped the bell, and started to fight the fish. Whatever it was, it felt much smaller and it came in without much issue, but it did put up a nice scrap coming in. 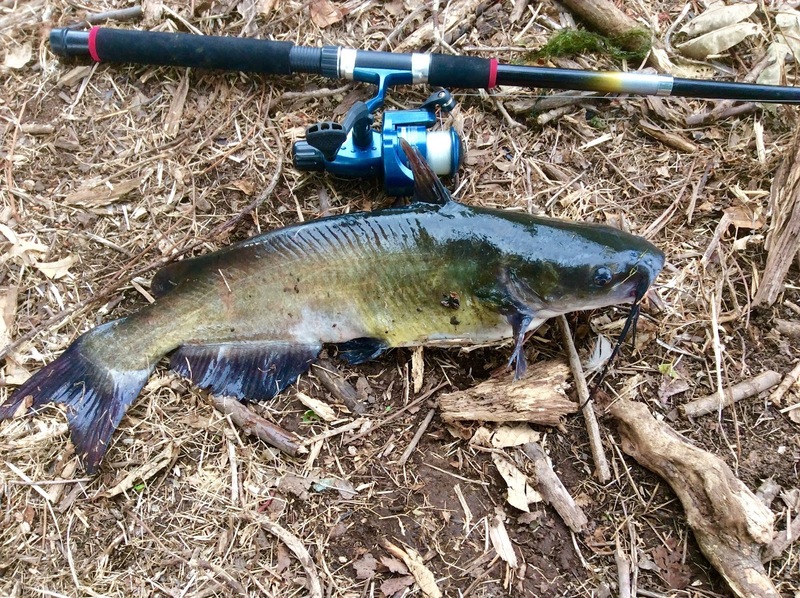 When the fish's head came out of the water, I immediately knew: bullhead, specifically a brown one. A pretty nice one, too. it weighed at 1.9 lbs on my scale. Beautiful mottling and undamaged fins were found on this one. Combined with the yellow bullhead I caught on the derby day, I had caught all 3 standard sized catfish in NJ from this one pond! It was a great way to end the day and I'm sure I'll return in the future. I had been looking forward to this trip for a while... My Grandpa and I had booked an afternoon party boat trip on the Queen Mary. I was hoping to rack up on saltwater lifers like searobins, seabass, dogfish, and fluke. I can't say that was a bad decision, though. Action was constant the entire trip. In fact, every single person on the boat caught fish! The tactic of the day was to drift spearing and squid combos, moving throughout the day to find fish. 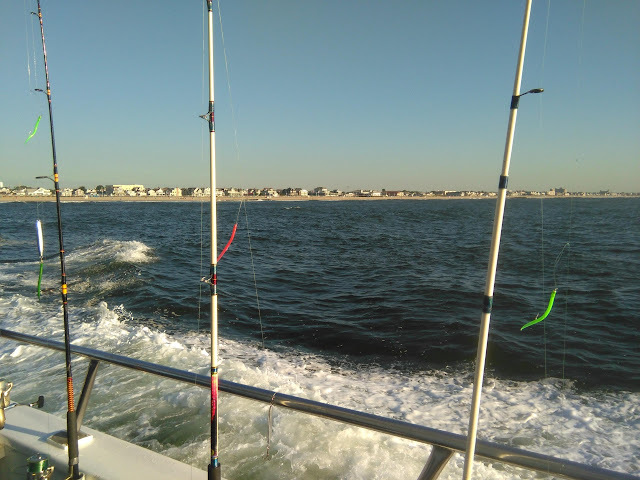 The first spot we stopped at was near the mouth of the Manasquan. I dropped my rig down, and not a minute later, I hauled up my first fluke! 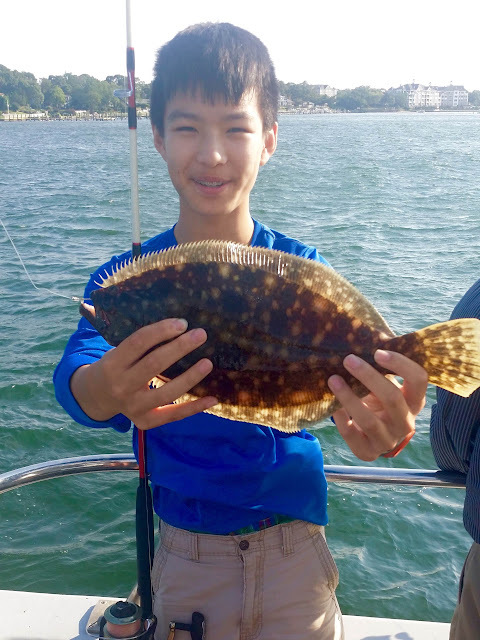 Of course, it was small by NJ standards (around 12 inches), but it was only the second fluke brought up on this trip. The funny thing is, as I was fighting the fluke, it didn't seem to fight that much. Mostly, it used its flat shape and held to the bottom. Reeling it in, it felt like dead weight with a tiny bit of wriggle. After that, the action was constant. The boat in total only got about 5 keepers (18"+), but there was a ton of shorts, and like I said before, everyone caught fish. After catching a short, My grandpa's rod suddenly doubles over. From later experience, Those big fluke fight hard! 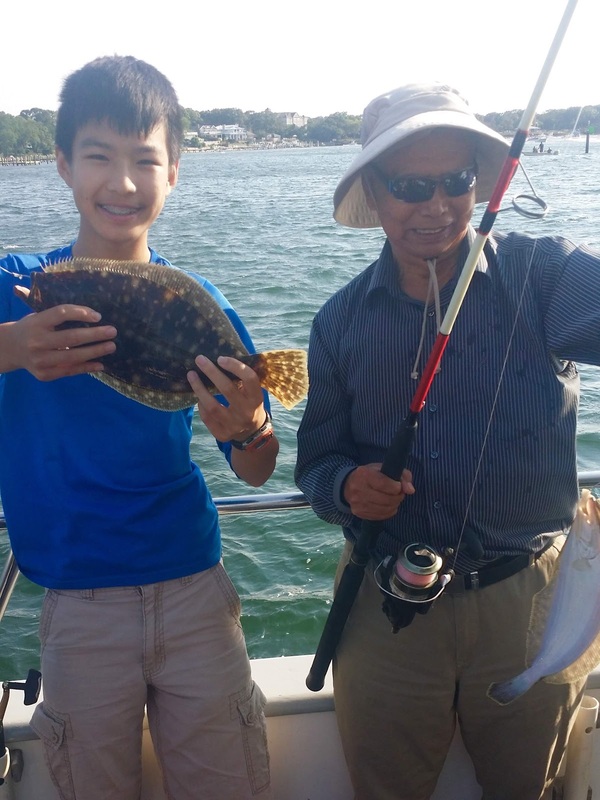 He brought the fish to the surface, and the mate swung the net and brought up a nice fluke. It was just over 18 inches, so we tossed it in the cooler. Meanwhile, I was fishing with a searobin strip about 8 inches long. I was just drifting it when the rod went into a deep arc. The fish then took off, even peeling drag in some of its runs! I got it to the surface, and then the hook popped out. I was bummed, because that would've been a keeper, but I continued fishing anyway. Not 10 minutes later, My rod arcs again and I bring up a nice fluke, my new PB! It was 15 inches, so not a keeper, but it was my biggest! This one fought pretty hard, but not as hard as the one that popped off. 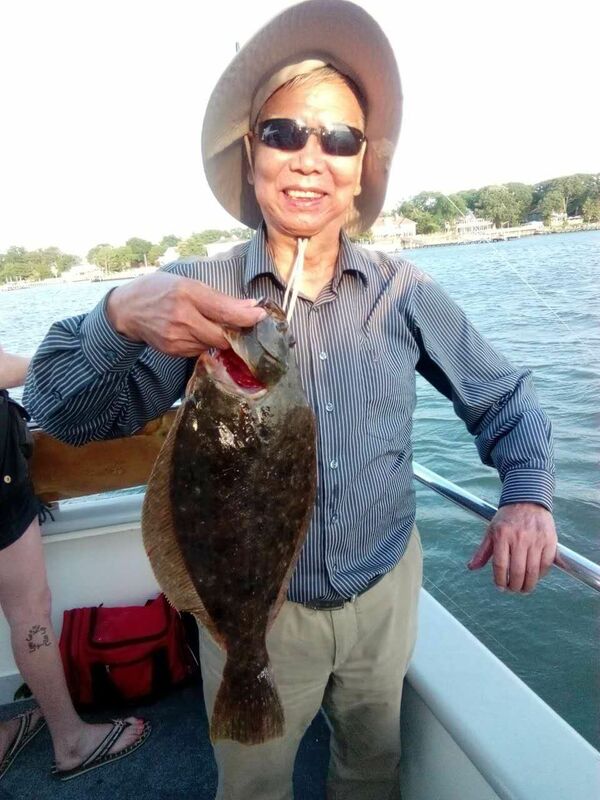 At another spot further into the river, my grandpa brings up a monstrous fluke-around 22 inches. Alas, it popped off right at the surface. Well, I guess that's fishing. The action peaked when my grandpa and I got a double on fluke, but both shorts. We ended the day with 11 fluke total, my grandpa with 6 and myself with 5. I was really hoping for a searobin, but it was not to be today. Only two were caught all day, and they were used for bait. Even though I didn't get a robin, I feel that the day was very successful and fun, and I'd love to do it again!